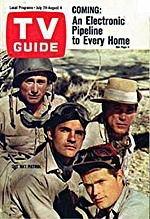 The show was loosely based on the real life WWII exploits of the Long Range Desert Group. This groups mission was to harass, damage and attack as many enemy convoys as possible, thus impeding Germany’s goals in the African campaign. The jeeps, trucks and halftracks that they used were as much as possible authentic. Many of the vehicles were found abandoned in the Spanish desert where a lot of the filming was done. The most historically incorrect aspect of the show was that American GI’s didn’t actually serve with the Long Range Desert group and the term Desert Rats was given to the British regiments in that campaign. Because of this the show was pulled off the air in the UK. Hans Gudegast changed his name to Eric Braeden and became wildly successful as Victor on The Bold and the Beautiful and then The Young and the Restless daytime dramas.